We won the tender for the next BP catalogue! Choosing Valentine’s Day gift is the source of sleepless nights for many people. Everywhere around, shops attract us with hundreds of special offers and promotions which make us feel dizzy. It is not easy to make a choice when we really want to find the right thing. In order to facilitate this task, LOT Polish Airlines organized special promotion during which the clients had the opportunity to buy tickets for the couple at a special price. PA agency was responsible for the creative concept of this advertising campaign. Having modified a little the lyrics of the song by The Beatles, we were communicating that LOT is all you need for you and your loved one on Valentine’s Day. 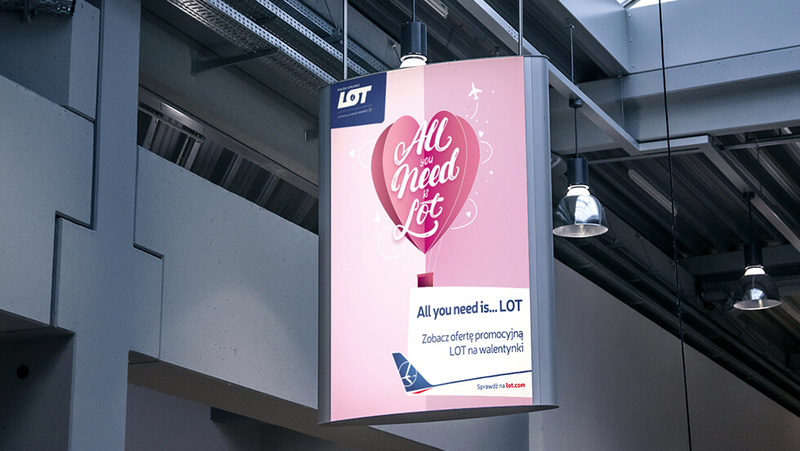 “All you need is LOT” – this was the slogan of the Valentine’s Day Promotion. On February 12th – 14th 2018, the clients had the opportunity to get a surprise for their loved one by organizing a romantic trip to a chosen destination. Marketing activities undertaken by us were conducted not only on the Polish market, but also in Germany, France, Italy and Hungary. Within the framework of the project, we were responsible among others for the Key Visual, promotional slogan, mailings, banners as well as graphic creations for the lot.com website and social media. PA has been providing its services to LOT Polish Airlines for 4 years. In the agency we are responsible for preparing creative concepts both for sales as well as image campaigns. The results of activities undertaken by PromoAgency for LOT can be seen offline and online on nearly 35 markets all over the world.